Crunchyroll has announced the "Powered by Crunchyroll" program to team up with conventions around the United States to bring benefits to their premium members and VRV subscribers. The first conventions announced as a part of this program are Anime Boston, Anime Weekend Atlanta, and Anime NYC. The program promises to give perks like discounts, early access to the exhibit hall, panels, or events, and additional convention-specific items. 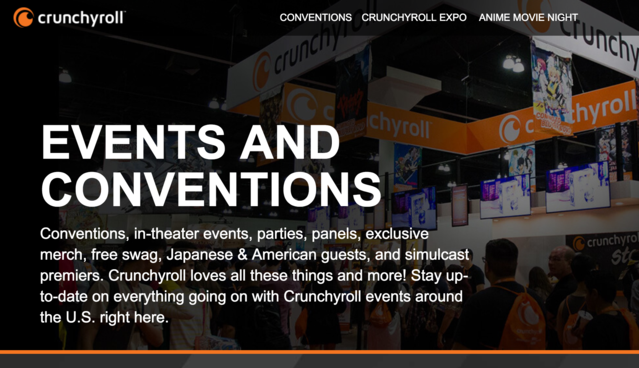 Crunchyroll has launched a site at CrunchyrollEvents.com which has information on these conventions, Anime Movie Night, and their upcoming Crunchyroll Expo convention. The site also provides information on joining the Crunchyroll Events Crew Program and their Outreach Program for libraries and clubs.